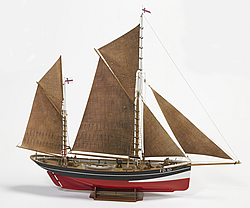 Billings Boats BIL701 FD10 Yawl Arnanes Danish Seiner 1/50 scale wood ship kit! A typical Danish seiner, with a gross tonnage of 63.43 and built in 1929/1930 at the Nyborg Shipyard in Denmark. The ship was sold to the Faroe Islands in 1930 as the “Sjostjornan” TG II. After a period of 20 years with various owners and names, the ship was sold to Iceland in 1950, and was now called “Arnanes”.